By Gemma Kavanagh | March 8, 2015. Dublin faced Kerry in the NFL Division 1 in Killarney last Sunday but left empty-handed as Kerry fought hard to win the match, Kerry 0-15 Dublin 1-10. Dublin had a lively first half with Jack McCaffrey scoring two points putting them in front by the break, it was 0-7 to 0-6. Bernard Brogan, who was introduced at half-time scored a goal on 61 minutes and there was just two points in the difference between teams but Kerry’s concentrated defence ensured Dublin didn’t get any closer for the remainder of the game. Eamonn Fitzmaurice, the Kerry manager, spoke to the Irish Times, “It’s such a competitive league, and we’re delighted with another win. This time the last two years we’d zero points, and didn’t get carried away, so we’re not going to get carried away with two wins, either”. 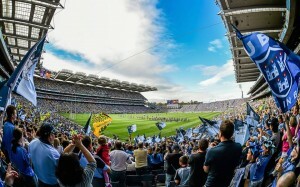 Dublin finished with one red, five yellow, and two black cards while Kerry had two yellow and two black, and Dublin manager Jim Gavin hardly concealed his dissatisfaction that his team were apparently subject to harsher calls. Kerry have hit the midway point in the Allianz League and are well positioned for one of the semi-finals, however Dublin, with two defeats in their three games, now need to worry about avoiding relegation. Dublin’s footballers face Tyrone next Saturday night in Croke Park (7.0) with the hurlers playing Cork in the curtain-raiser (5.0). Scorers – Kerry: B Sheehan 0-6 (0-4f, 0-1 ’45′), S O’Brien, BJ Keane, J Buckley 0-2 each, D Moran, M Geaney, P Geaney 0-1 each. Dublin: B Brogan 1-2 (0-1f), J McCaffrey 0-2, T Brady, K McManamon, E O’Gara, C Kilkenny, S Carthy, D Rock (0-1f) 0-1 each.